Every user knows the importance of the “@” symbol in internet communication. Though the symbol barely existed in Latin America before the emergence of email, Spanish-speaking feminist activists immediately claimed it to replace the awkward “o/a” used to indicate both genders in written text, discovering embedded in the internet an answer to the challenge of symbolic inclusion. In repurposing the symbol, they changed its meaning. In Interpreting the Internet, Elisabeth Jay Friedman provides the first in-depth exploration of how Latin American feminist and queer activists have interpreted the internet to support their counterpublics. Aided by a global network of women and men dedicated to establishing an accessible internet, activists have developed identities, constructed communities, and honed strategies for social change. And by translating the internet into their own vernacular, they have transformed the technology itself. 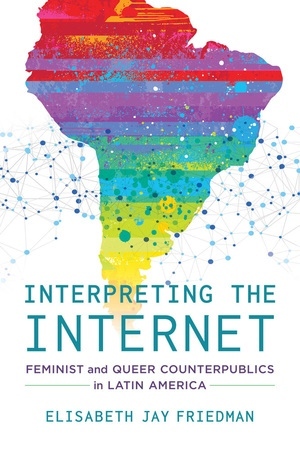 This book will be of interest to scholars and students in feminist and gender studies, Latin American studies, media studies, and political science, as well as anyone curious about the ways in which the internet shapes our lives. Elisabeth Jay Friedman is Chair and Professor of Politics and Professor of Latin American Studies at the University of San Francisco. She is the author of Unfinished Transitions: Women and the Gendered Development of Democracy in Venezuela, 1936–1996 and the coauthor of Sovereignty, Democracy, and Global Civil Society: State-Society Relations at UN World Conferences.